End of the Winding Gulf Route. I want to thank Tom Marshall for sharing his knowledge and work at the N&W archives. The N&W archives also are an invaluable source for rail documentation in the Winding Gulf area. The creation of this series of pages would not be possible without those efforts. This is a STARTER series and as such there will many revisions. 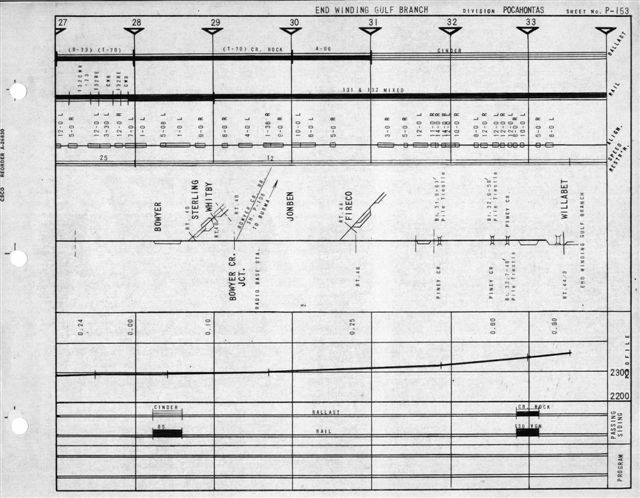 The Rail chart above is still puzzling to me. Note the name of Sterling which appears very near Whitby. Sterling was a proposed Whitby town name and to date this is the only printed map to show this that I am aware of. Comments? Send me (Mark Combs) mail. Back to Main Whitby Page To Whitby Mining History Page Whitby Rail Stations: Trico and Burma.